Cardiovascular diseases are the leading cause of death globally, they cause more deaths than all other causes together and affect most low- and middle-income countries. Within the non-communicable diseases, cardiovascular diseases with malignant diseases are the cause of almost three-quarters of deaths in the European region. The estimations show that at least 80% of all heart diseases, stroke and type 2 diabetes can be prevented. Each year, cardiovascular disease are the cause of 17.3 million cases of premature death, and by 2030, it is expected that 23.6 million people will die of these diseases. These are projected numbers/results from the World Health Organization (WHO), and it is expected that CVD will remain the leading cause of death worldwide. 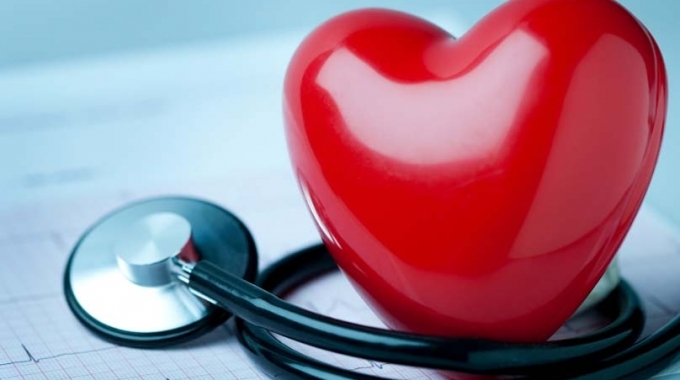 The most common risk factors for cardiovascular diseases: high blood pressure, high cholesterol, obesity, poor diet, smoking, lack of physical activity and elevated blood sugar. A significant number of deaths attributed to smoking or tobacco, which increases the risk of death from coronary heart disease and cerebrovascular disease 2-3 fold. The risk increases with age and is higher in women than in men. 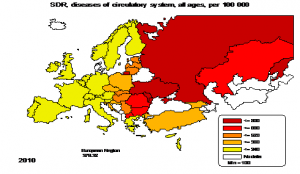 In 2014, in the Republic of Macedonia, died 11 270 people from diseases of the circulatory system, with a mortality rate of 545.1 per 100,000 inhabitants, of which 5435 were men and 5835 were women. Diseases of the circulatory system accounted for 57.2% of the total mortality and they have the first place of the cause of death. The mortality rate from circulatory diseases in the total population in Macedonia in the period 2010-2014 did not change significantly. In 2010 the mortality rate was 538.6 and 545.1 in 2014 per 100,000 population. The specific rates by age from circulatory diseases among the population over 65 years was significantly higher, compared with the specific mortality rate among the population of 0-64 years. The mortality from ischemic heart diseases was significantly greater among the population over 65 years compared with the mortality of the population to 64 years. The rate of mortality from cerebrovascular disease aged over 65years in 2014 was 1164,9 per 100,000 population, aged 64 years, 26.3% ooo, of which it is evident that mortality is significantly higher than 65 years. According to gender, in the period 2010-2014, the mortality from circulatory diseases is slightly higher among women than men. The death rate from ischemic heart disease in the period 2010-2014 was higher among men (Chart 7), while the death rate from cerebrovascular disease was higher among women (chart 8). In the period from 2010-2014, in the Republic of Macedonia the acute myocardial infarction accounts for about 95% of ischemic heart disease and cerebral infarction and stroke, bleeding or unlabelled infarction by about 88% in cerebrovascular disease. According to the WHO HFA database, in 2010, the standardized mortality rate from diseases of the circulatory system per 100 000 population amounts: 113.9 in France, 119.1 in Israel, Croatia 370.8, 553.0 in Macedonia, Bulgaria 621.7, 732.7, in Ukraine etc.. Considering the fact that there is a 80% chance to prevent the heart disease, Macedonia implements measures based on the evidences, in order to prevent risk factors such as tobacco use, unhealthy diet, physical inactivity and harmful use of alcohol, timely recognition of CVD, improved treatment of secondary and tertiary level, strengthening the health system personnel, equipment, reconstruction of old and construction of new hospital facilities and other measures. The main objective is to address the growing burden of population with cardiovascular disease and reduce disability and mortality from these diseases. Institut of Public Health of the Republic of Macedonia and 10 Public health centers within the public health activities in order to raise public awareness for the prevention of cardiovascular diseases, organize continuous lectures, debates and promotional materials produced in this area. This year, will be marked World Heart Day – September 29, as the main event in the City Park in Skopje, on location Shell, on September 27 (Sunday) in the period from 9.00 to 14.00 pm in cooperation with NGO Healthy Future Association of Citizens suffering from cardiovascular diseases, representatives of health institutions in the public and private sector and other interested structures.